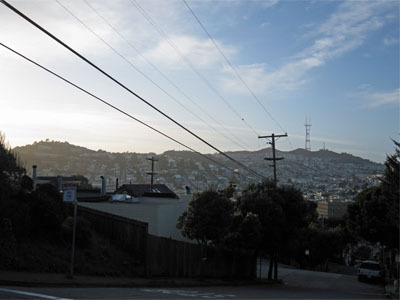 Explore the streets of the Mission, SOMA/South Beach, Mission Bay, the Dogpatch, Potrero Hill, Noe Valley, the Castro, Glen Park, and Lower Haight! Thirty locations are circled on a map of nine San Francisco neighborhoods. On foot or bike, how many can you visit in 90 minutes? in 3 hours? Score points by visiting checkpoints in any order, and answer a simple question to prove you were there. Those who score the most are the winners! Be competitive or casual; go team or solo. Fun for families, runners, cyclists, and anyone who likes to explore!! Awards at the finish, afterparty to follow! On Saturday, 02 February 2013, two event durations will be offered: 3 hours and 90 minutes. You can do either on foot or on bike. The headquarters will be at the Bryant St. Sports Basement. 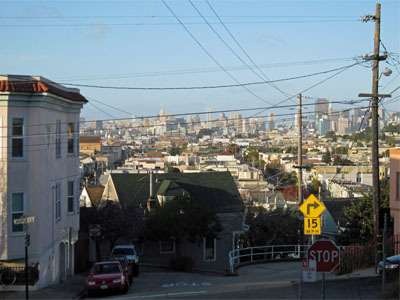 This is the second annual Mission Street Scramble. 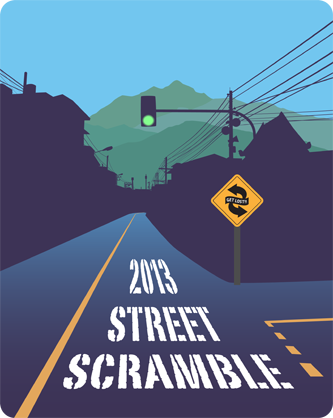 Check out the description and our calendar of Street Scramble events! 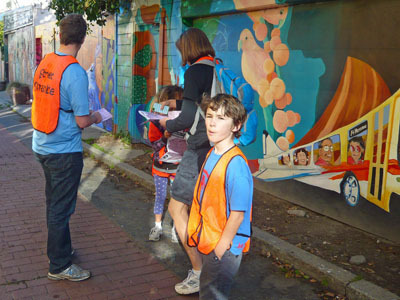 This event is the eighth in the 2012/2013 Urban Adventure Hunt series, and your next chance to collect points and win a trip to the series Final, the San Francisco Night & Day Challenge. Transit directions: Take BART to 16th St.–Mission station and walk eight major blocks east and one block north, or take Muni 22–Fillmore or 33–Stanyan east to the Bryant Street stop. Sports Basement has a small parking garage inside, and we are guaranteed to fill it completely, so taking transit is strongly encouraged. The event headquarters and afterparty will be at the Bryant St. Sports Basement. Snacks and beverages will be provided! Mission Street Scramble participants are treated to a 10% discount off everything in the store. Sports Basement is a sporting-goods retailer with four locations in the San Francisco Bay Area and an online store. Besides selling the best brands at basement prices, SB is a community center, a hangout, a hub. Its stores are like a second home to local athletes and groups who use its space daily for club meetings, potlucks, and to start workouts out of its front doors. Collage Gallery in San Francisco features elegant jewelry made by local women artists, typography & signage, refurbished clocks & cameras, clothing, and unique furniture. This home decor store and art gallery offers lots of pleasing items to beautify one's abode. Objects re-invented, recycled and given a new life, ready for your home. When you arrive at a Street Scramble event, you will check in (some events don't sell out and allow onsite registration). Then, an hour before the start time, you will receive a map with thirty (or so) checkpoint locations circled. Each circle has a number between 10 and 99. The point value of the checkpoint is equal to its number rounded down to the tens; for example, Checkpoint 35 is worth 30 points; Checkpoint 12 is worth 10 points. The back of your map will have a description of a feature to be found at each checkpoint, such as "Statue" or "Pier". You will also receive a scorecard with the same information as on the back of your map; use this scorecard if you are not using electronic scoring. We offer two electronic ways to record your checkpoint visits. One option will only be available at select checkpoints that are at locations of participating businesses, and only to those entrants who have a smartphone capable of recognizing QR codes, and the necessary phone app. Simply snap a picture of the code and get on your way! If you don't have the hardware or the app, just answer the multiple-choice question. Team 191 Checkpoint 35 Answer A at 10:31:23. We make our maps using information from a number of sources. The map will not have any street names on it, so it will be important for you to keep track of where you are on the map. When you return, you will turn in your scorecard; if you used electronic scoring, your score will be ready and waiting for you. (In case your phone turns out to be less sweat-resistant than you thought, we can handle answers that are partially submitted electronically and partially handwritten.) It is important to be on time because you will lose points for each minute you are late. We will keep your scorecard, but you get to take your map home with you. If your answers are handwritten, we will tally your score while you enjoy refreshments, included in your entry fee. After refreshments, awards will be given out for those with the highest scores in different divisions and categories. As a minimum, we will award the best men, women, and mixed teams in the following categories: Juniors (each team member must be 20 years of age or younger on 31 December 2013), Masters (40 or older on 31 December 2013), and Open. Awards will also be given to the best family teams; a family team is one that has anyone 20 years of age or younger, and also someone 21 years of age or older. Please add $10.00 if you would like us to manually tally a handwritten score sheet for your team. There is adequate parking in Sports Basement's basement. Public transit is advised. Registration and check-in will open at 8:30 am and will be upstairs on the 5th floor. Safety is our first priority. All cyclists must wear a helmet and stop at all stop signs and red lights. There are only certain places in which you can cross Interstate 280, U.S. Highway 101, and Interstate 80 (all freeways). These places should be obvious on your map; some are accented with red-triangle access signs. In addition to streets that cross, there are three pedestrian/bike bridges that are valid and scenic crossing points. If it's unclear from the map as to where you can cross, please just ask us before the start! 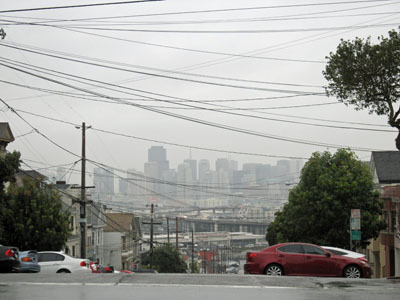 The Bayshore Blvd./Potrero Ave./Cezar Chavez St./Highway 101 interchange, in particular, is an entangled spaghetti soup of ramps that go every which way, and is particularly hard to interpret on the map. There's no absolute need to go through this area on this course, and choosing this area as a place to cross will slow you down. We suggest taking nearby pedestrian/bike bridges. If you do want to explore this area, the gist is that you can cross under the freeway, but you have to be careful not to get on freeway ramps; traffic will also be coming at you from several directions in this area, and most drivers won't be expecting you. There can be a lot of car and bicycle traffic; please be careful and cross at dedicated pedestrian crossings. Be especially mindful of turning Muni buses; drivers sometimes can't see a quickly moving pedestrian off to their side. We strongly encourage you to wear a Street Scramble safety vest to enhance your visibility. You can borrow one from us at no charge. This event is the eighth one one in the series. Here is last year's announcement, but in brief, it works this way: Each Street Scramble event is worth a maximum of 1000 points, and Mill Valley and Santa Cruz Street Scramble events, with their 7-hour competition, are worth 1600 points. We will add together the points from the 12 events that are scheduled between late June of 2012 and late May of 2013. If your team participates in the 90-minute division, we will multiply its points by 1.5; if it is in the 7 hours, there is no penalty, enjoy all the extra points that a long run or ride in the city entails! In order for event scores to count for the series, your team should keep the same name, compete in the same age/gender category, and maintain at least one common member for the Street Scramble events it participates in. Prizes: In each category (foot and bike; Open, Masters, and Juniors; Men, Women, and Mixed; and Family), there is a single first-place award to the best team, and it is a free entry to San Francisco Night & Day Challenge in 2013. A team has to participate in at least three Street Scramble events in order to be eligible for the award. But furthermore, we'll combine your points from the Street Scramble events and SFND, and a few very lucky—or fast—teams will win an expense-paid trip to the Seattle Night & Day, which occurs about a month after SFND!! We will showcase one or two categories for this award. We are sorely late with updating this year's series standings, and hope to do this either the week of or the week after Mission Street Scramble. Each team must stay together throughout the event. It is not allowed to split up to cover more ground. The finish time is taken when the last team member crosses the finish line. Travel under your own power only. It is not allowed to take Muni, BART, or cabs. It is not allowed to look up answers to checkpoint questions without actually going to the checkpoint; in particular, you cannot use Street View, Panoramio, or the likes. Using Street View would be just like driving past everyone in a car at a running race! You can, however, use the map on your smartphone, and GPS. You are welcome to use any and all maps of the area you may bring. Please stay off private property. All checkpoints are immediately reachable on bike and the course does not force you off the road. 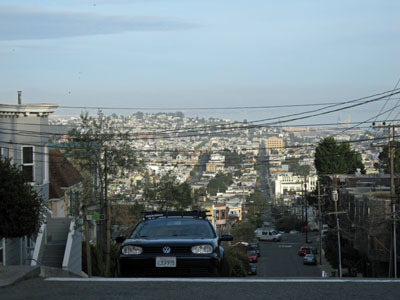 There are many stairs in this part of San Francisco; on them, you will have to carry your bike, but you can also go around on the streets. A road bike is unquestionably an advantage over a mountain bike for this event. The map for this event is at 1:20,000 scale with 20 ft. (6.10 m) contours. This map is the second step on the path towards Get Lost!! 's future urban-map standard... which means it's most of the way where we want it to be. Most of the data for this map, a part of the comprehensive Greater San Francisco map, is from San Francisco GIS. The elevation contours are exceedindly precise. We took some time to classify the streets according to their nature and width (regular street/narrow driveway/unpaved/stairs/wide street/divided arterial). Light purple fill is for developed areas, mostly private property, where you shouldn't go unless you are on a mapped street or path through it. Sometimes you can physically get through these areas without problems, but there are posted no-trespassing signs, or else people clearly don't expect you to go through. Detail is rarely shown inside these areas. In particular, if there are streets that visibly do not connect and the gap between them is purple, it means you cannot get through that area, either physically or legally. There's probably a house or a fence in the way. You should not plan on shortcuts through the purple being valid route options. We accent some of the ways you can't go with purple crosses, but it's your responsibility to stay off private property. An area as large as this cannot be mapped perfectly—the first time, and perhaps ever. Access details change daily. It is entirely possible that the map will lead you somewhere you shouldn't be. The course of action we expect you to take in this situation is to retrace your steps back to public property. Please do not force your way through. Staying on public property helps us focus on bringing you excellent events, instead of dealing with property owners and authorities. Your cooperation is key to success of Street Scramble and to our ability to create future exciting events. Light grey fill is for developed areas, most of them public property, some of them private, that you can get through. These are typically school and college campuses, apartment complexes, shopping areas, and municipal building areas. Larger buildings are shown inside these areas—but not all buildings. We plan to show most of the obstacles to movement in these areas, such as high fences, but most fences aren't on this edition of the map. So, it's best not to expect to be able to get through the grey, but keep your eyes open for shortcuts and you may be pleasantly surprised. There are typically no good ways for bikes to get through the grey, but sometimes there are. Dark grey is large buildings. You usually can't get through them, but sometimes you can. Passages through buildings are shown with light grey. Brown is for parking lots and office parks, that is areas that are mostly paved. Some of the large office buildings in these areas aren't yet shown; they eventually will be. You are allowed to go through these areas. Green is for forested parks. You are allowed to pass through all green and white areas; whether you can physically do so is another story. On this course, all parks into which you can reasonably go are passable, and few have impassable fences across them. If you see a fence, chances are very high that there's an open gate less than a half-block away. White is for open (treeless) undeveloped areas, such as many of the parks. At this Street Scramble, we are introducing something new. An electronic map of the 37 checkpoints will be available at map issue time, one hour before the start. You are welcome to download this map on your smartphone, and use it however you wish. The course has been designed entirely by Vladimir Gusiatnikov and vetted by Scott Donald, Shirley Donald, and Nancy Lindeman. There are are 37 checkpoints worth the usual 1000 points. Most of the checkpoints are in the Mission District, with others in South of Market (SOMA)/South Beach, Mission Bay, Potrero Hill, the Dogpatch, Noe Valley, Glen Park, the Castro, and Lower Haight. The optimum actual distance to travel in order to get all checkpoints is about 50 km (the exact distance will be posted here before the event), with ample climb. This calculation assumes taking stairs; cyclists will perhaps favor longer routes. This course is considerably longer than the course at last year's event, but the increase comes via the inclusion of SOMA, which is quite flat; so the course will feel less hilly. We believe it is possible for very fit cyclists to get to all checkpoints on bike within 3 hours under ideal conditions, no traffic slowdowns or equipment malfunctions, and navigating perfectly; no foot teams should expect to come close to being able to collect all checkpoints. The late penalty is 10 points for each minute, or fraction thereof. Remember, you can switch from the 90 minute division to the 3 hour division at any time, even while you are on the course. 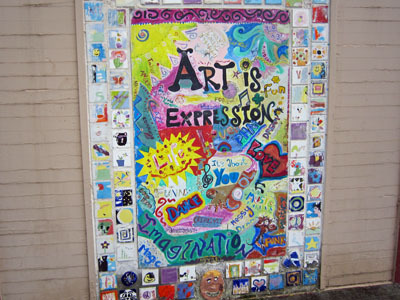 Mural art, and many other things in a busy city, change daily, and the artists don't report to us! Several checkpoints used last year now have entirely different murals, and a lot of what you see in Google Street View has been painted over. 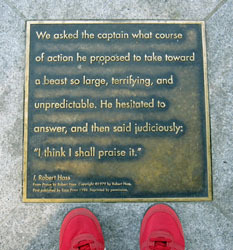 It is possible that some of the questions no longer apply. In this case, answer the question as well as you can, and take a picture of the site if you have a camera; if the checkpoint site description has changed and you can prove you have been in the correct location, we will give you credit for the checkpoint. The system is currently on Eastern time. We may or may not be able to fix that before the event. Finally, if you encounter an error message, please let us know after the event. Please do not send praise, comments, blame, bug reports, missing checkpoint notes, or status updates to this number—they are all quite welcome, but use +1 971 998 0321 instead. They will all be read and acted upon. We will not be using QR codes at this event. When you mark your answer, please also make sure to write down the time you visited each checkpoint. Doing this is not mandatory, but allows for some entertaining post-event route analysis. Your finish time will be taken when you hand in your score sheet. Forum for the Mission Street Scramble. Facebook event for the Mission Street Scramble.